911 Memorial sculptor Jorg Dubin became this week the first write-in candidate for City Council in recent memory. His candidacy became official when the names on his nominating papers were certified Tuesday by the Orange County Registrar of Voters. “I was actually approached about six months ago about running for City Council because I’ve been in the community for 42 years and a full-on working artist the whole time,” said Dubin. 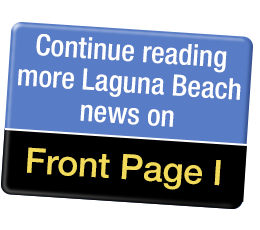 “My big concerns are that Laguna needs to really embrace unconventional people and lifestyles and also the fact that the City was founded by a bunch of artists in the early 20th century. But now the artist community is being decimated by [the rising cost of] real estate and the lack of support by the city for the artists that are still here. Louis Longi, sculptor of the Art Star Awards, has been named Dubin’s campaign manager. Dubin’s first appearance as a candidate will be at the upcoming South Laguna Civic Assocation Forum at The Ranch. Dubin said artists don’t have enough places to live and there is a real lack of functioning art studios. He believes the only place for artists is the canyon, which will require a change in city leadership, he says. There also has never been a write-in candidate on the council that anyone can recollect. Verna Rolllinger, who served six terms as City Clerk starting in 1976, said she has a vague memory of a write-in candidate in the early 1980s, but not a winner. Dubin said he knew about the deadlines for filing as a candidate in July and August. What he was told – for which he blames no one – was that in order to run as a candidate there was a $1,000 fee involved. He didn’t want to spend $1,000 to get his name out. He is running as Comrade Dubin. Dubin and Longi feel that the city just talks about being an artist colony, but the arts are not really primary concern. “I’m concerned with what this place is going to look like 20 years from now for artists, creatives, when they can’t afford to be here. They’re not getting support from the city…it’s a concern. “If the community wants to shift then it should stop calling itself an artists’ colony and instead [call it] an expensive coastal community for people with means and also for retirees. “It feels like there’s a lack of vision on the City Council. And I also think it’s time for other people to be involved in city government, more than just lawyers and CPAs. I think it will be good for the community to have another perspective that comes from the creative community. When we look at the cultural heritage of Laguna Beach, it feels like we’re trending away from trying to continue artistry forward.